This is an expired product, it is no longer being sold in South Africa by this supplier. Kindly search for an alternative on our site. This product is no longer sold. It is not available at this South African supplier. Kindly search for an alternative on our site. Subject to correction, the product was first added on 2019-02-11 14:10:55 and the last date we have for this product is 2019-02-11 14:10:55, where the last unit was sold for R 4640, which may have been a final clearance price. Huawei Honor 7X Black 5.93" HD Kirin 659 3GB RAM / 32GB ROM 16MP+2MP AF Dual Rear Camera, 8MP front camera, TDD LTE FDD LTE, micro-USB Wi-Fi 802.11b/g/n, 2.4GHz, BT4.0 LE, GPS / AGPS / Glonass, micro-USB, battery 3600mAh, Android 7.0, Dual SIM Copyright © 2019 ComXpert International CC - COPYING IS ONLY ALLOWED FOR THE PURPOSE OF SENDING US ENQUIRIES. E&OE. © Respective owners and brand holders. © 2019 ComXpert International CC. The contents has been generated by ComXpert International CC (//www.comx.co.za). All products are sourced locally in South Africa and the warranty is that of the local supplier only. E&OE. © 2019 Respective owners and brand holders. This table has been carefully researched and generated by ComXpert International CC (//www.comx.co.za), however, errors and omissions may occur. Only references to South Africa apply. All products are sourced in South Africa from the official suppliers and the warranty is that of the local supplier. E&OE. This table and our site's content may be used on condition that this notice and link remains intact and unaltered. HISENSE F20 Hisense F20 cellphone ROSE GOLD 5.5"
The best price and guaranteed service and backup from official computer suppliers in South Africa for the Honor 7X Black (Dual SIM) Huawei Honor 7X Black 5.93" HD Kirin 659 32GB LTE Android 7.0 Dual SIM Smart Phone. 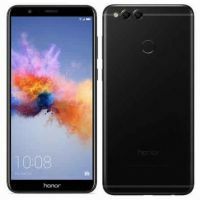 Find related Honor 7X Black (Dual SIM) Huawei Honor 7X Black 5.93" HD Kirin 659 32GB LTE Android 7.0 Dual SIM Smart Phone products in our Smart Phones Category for even more options. Read reviews and find out about Honor 7X Black (Dual SIM) Huawei Honor 7X Black 5.93" HD Kirin 659 32GB LTE Android 7.0 Dual SIM Smart Phone. Discounts, specials and cheap prices only at ComX Computers.